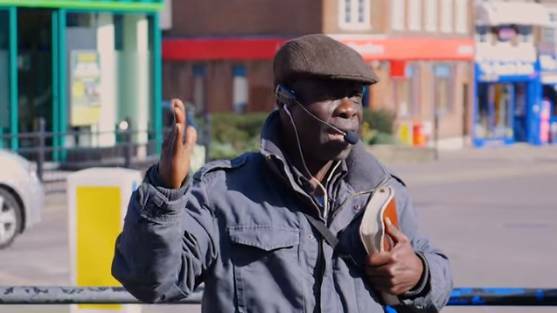 As previously reported, Oluwole Ilesanmi, pastor of Redeemed Christian Church of God, had been preaching outside of Southgate Station on Feb. 23 when Ambrosine Shitrit of the organization Eye On Antisemitism noticed that a man was taking issue with the preaching. She got out of her car and began filming with her phone. “What are you doing here?” the responding officer asked, according to video footage recorded by Ambrosine. “I am preaching,” Ilesanmi advised. “I am going to require you to go away,” the officer stated. “You can never!” Ilesanmi exclaimed. “Okay, then I will arrest you for breach of peace, plain and simple,” the officer threatened. “What breach of peace?” Ilesanmi asked. Ilesanmi again refused to leave. “I will not go away because I need to tell them the truth,” he replied, and resumed preaching. “Jesus is the only way, the truth and life, and nobody …” he began, but was quickly interrupted by the officer. “Oh, you don’t want to listen to that? You will listen when you’re dead,” Ilesanmi warned. The officer then placed Ilesanmi in handcuffs, while his partner another grabbed the Bible from the preacher’s hand. “Don’t take my Bible away,” Ilesanmi pleaded. “You should have thought of that before you were racist,” the officer replied. Ilesanmi says that he was then transported to the police station, but was not taken inside. After being searched, and as he advised that he did not wish to go home yet but wanted to continue to preach, Ilesanmi was dropped off miles away at a small bus stop area. A bus pulled up to the area, and Ilesanmi presented his Oyster pass, which would entitle him to a ride within the London transport zone. However, the driver told Ilesanmi that 84 Metro Line buses don’t accept Oyster cards, and that he would have to get down. Ilesanmi, 63, would have been stranded had it not been for another passenger who decided to pay for his ticket. Ilesanmi then went back to Southgate Station, where he continued to preach for two hours undisturbed. The preacher, along with Christian Concern, continues to refute the police’s version of events. While the Metropolitan Police Service now says that Ilesanmi was transported 3.5 miles away to Hadley Wood, Ilesanmi’s bus ticket shows that he was actually taken 5.2 miles away to Wrotham Park. Police also assert that “officers checked that he had a bank card” so that he could obtain a ride home on the bus. However, Ilesanmi notes that he did not have a bank card, but an Oyster pass, which was not acceptable to the 84 Metro Line. Even if he did have a bank card, the transit system only accepts cash payments. “Oluwole was not taken to Hadley Wood. He was taken to Wrotham Park which is some distance away from Hadley Wood and is outside the London Transport zone,” Christian Concern reports.